The proliferation of information and communication technologies (ICTs) has created new opportunities for young people around the world to engage in digital work. Why focus on digital jobs? Critically, digital work is not only limited to work within the IT industry (e.g. software development, hardware design, networking), but also includes work where ICTs enable workers to find paid work online, often remotely (e.g. data entry, image categorization, graphic design, office assistance). Thus, while only up to 5% of the workforce in many countries works directly in the IT industry – high paying jobs with positive spillovers – the greater possibility arises from increases in productivity and innovation stemming from ICT in occupations across other sectors of the economy. Hence, there is a need to identify how developing countries – especially those facing a youth bulge – can take advantage of the opportunities of digital work, while also preparing for the coming effects of technological change. 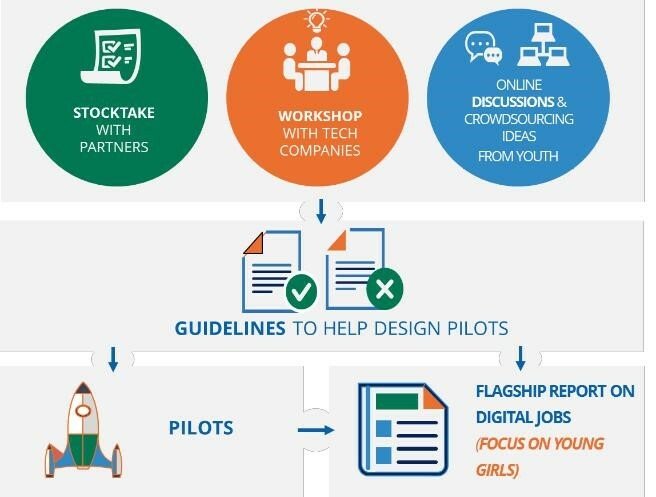 Moreover, what is not well known is how digital interventions have so far included women and what design elements could be helpful to connecting young girls to the digital economy. More gender-specific models could be developed that help address women’s constraints to accessing such jobs. With its partners' deep expertise in digital jobs programs, as well as gender-based interventions, S4YE can harness the potential of the digital economy to create robust, sustainable opportunities for young people. Digital jobs will be the first arm of S4YE's second-generation employment programs. The guidelines for these programs will have three key inputs: 1) stock-take with partners; 2) workshops with tech companies; and 3) input from youth, via discussions and crowd-sourcing. A key outcome, in addition to the pilot programs, will be S4YE’s next annual report, Digital Jobs for Youth: Focus on Young Women. Want to work with us on digital job opportunities for youth? Find out how you can get involved.